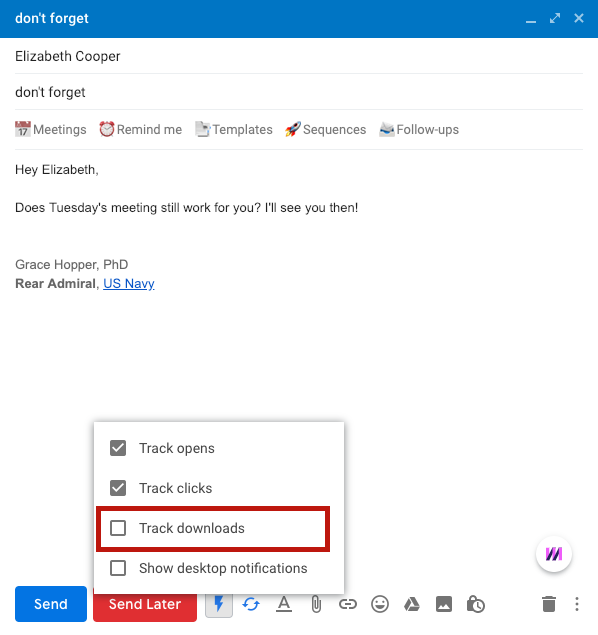 To send traditional attachments — where the attachment is attached to the email, rather than hosted online — hover over the paperclip icon on the bottom bar, and un-check the box to track downloads in the tracking menu. Then drag and drop your attachment onto the compose window, or click the paperclip icon to get a file selection menu. The file size of traditional attachments is limited to 25 MB, due to Gmail's attachment size limit. Want to send a larger file? Send a tracked attachment. Note that whenever you drag and drop images or GIFs onto an email, they'll always be added into the body of the email. If you would like to attach images as traditional attachments, you must use the paperclip icon. Want to track downloads of your attachment?